It was good advice, as members of Duke University’s class of 2012 could attest. At Duke’s commencement 11 days before, Zakaria had uttered precisely the same words. Zakaria’s Harvard and Duke commencement speeches were essen­tially identical, built around the same anecdotes and points and often the same language. The addresses have set some at Harvard and Duke atwitter. Not all of it, actually. Zakaria hit many of the same notes, including the line about ethics, in an address to the Johns Hopkins University class of 2011. He also used some of them for the Brown University class of 2009 and the Yale University class of 2007. Zakaria said the overlap was natural, especially in the Harvard and Duke speeches. He added that many other commencement speakers recycle their own material. That is true. Governor Deval Patrick spoke at six commencements in 2009; they overlapped so much that some students listened with homemade Bingo cards in hand. For a commencement address at Syracuse University this year, screenwriter Aaron Sorkin repeat­ed lines from a speech he had given there 15 years ago and zingers from some of his television shows. But not all high-profile commencement speakers are so predictable. Mayor ­Michael Bloomberg of New York City, for example, gave back-to-back, completely different speeches at Franklin & Marshall College and the University of North Carolina in May. And Temple Grandin, the autism advocate and livestock expert, who spoke at four commencements this year, said she made a point of never giving even roughly the same speech twice. “I find out about each campus, the place, and the people, and I try to deviate a lot,” she said in an interview. Consultants who handle graduation speakers said it was odd for someone, particularly a writer, to deliver the same keynote at two top-tier institutions within two weeks. Zakaria said that prior to this year he had made a point of delivering no more than one commencement address per season. But he accepted Duke’s offer last fall and two weeks later found himself on the phone with ­Harvard president Drew Faust. Zakaria said he "tried to make clear the themes would be similar" to Duke officials, and sent Harvard a draft of his speech beforehand. He opened with the same anecdote, and much of the same language, at Duke, Johns Hopkins, and Yale. Further identical language and similarities studded the Harvard, Duke, and Johns Hopkins speeches, including an anecdote concerning Art Buchwald and a stirring paragraph about enduring human talents, enlivened with a joke about modernist metal sculpture. A long bit from the Woody Allen movie “Radio Days” showed up in the speeches from Duke, Johns Hopkins, and Brown. The Harvard and Duke speeches featured the same story about the surgeon and writer Atul Gawande and the same extended riff on the power of cellphones, with an admonishment to students to stop looking at theirs (“Don’t think I can’t see you”). 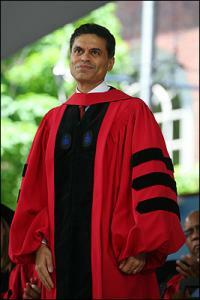 Zakaria was not paid for the Harvard and Duke speeches, though he received honorary degrees. Two people who had spoken with Harvard administrators said there was some disappointment in the ranks over the similarity of the speeches. But Harvard and Duke officials both said the talks were well received.